My sister-in-law gave me a doughnut pan for Christmas two years ago…maybe three. It’s what I asked for, had wanted for years, and yet I only used it to bake the doughnut mix she gave me with it until now! What is UP with that? I was Pinteresting (yes, I’m allowed to turn nouns into verbs haha) and came across Shelby’s baked banana doughnuts with a browned butter rum glaze and I HAD TO HAVE IT RIGHT THEN…or at least my own version of it. :) I had my nearly forgotten doughnut pan, a single overripe banana, and the baby was taking a nap – it was like the stars aligned and God smiled down on me in that instant. I got to work and boy oh boy. These were quick to make and so delicious! Brown butter and banana are a match made in heaven. Actually, browned butter makes everything better, don’t you think? Preheat oven to 350F. Spray a 6-well doughnut pan with oil and set aside (I wipe off the top with a paper towel to reduce the amount of baked-on oil build-up on there but that is your call). Whisk together the flour, baking powder, cinnamon, and salt in a medium sized bowl. In a separate smaller bowl, mash the banana, then whisk in the egg, buttermilk, oil, and sugar. Add to the dry ingredients and stir together until just combined (a few small flour lumps are OK). You can either use a spoon to fill the doughnut pan or put the batter in a ziploc bag and snip a corner to squeeze the batter into the pan. Fill each well 3/4 full. If you have extra, you can make it into mini muffins or wait until the first batch is done baking to make a couple more doughnuts. Bake doughnuts for 12-15 minutes, or until golden and doughnuts bounce back when lightly pressed. Turn out onto cooling rack to cool completely. Posted in Breakfast, Sweets and tagged baked doughnuts, banana, brown butter, browned butter, glaze, recipe. Bookmark the permalink. 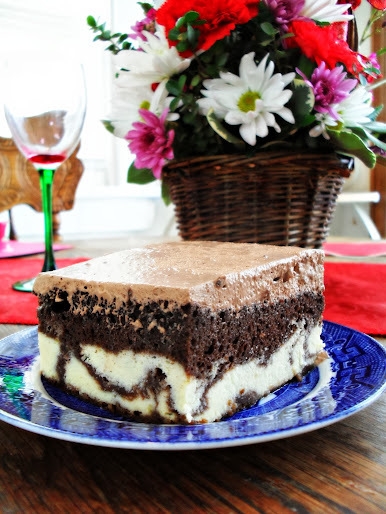 I’m pinning this recipe to try very soon, thanks! These look fantastic, Veronica. 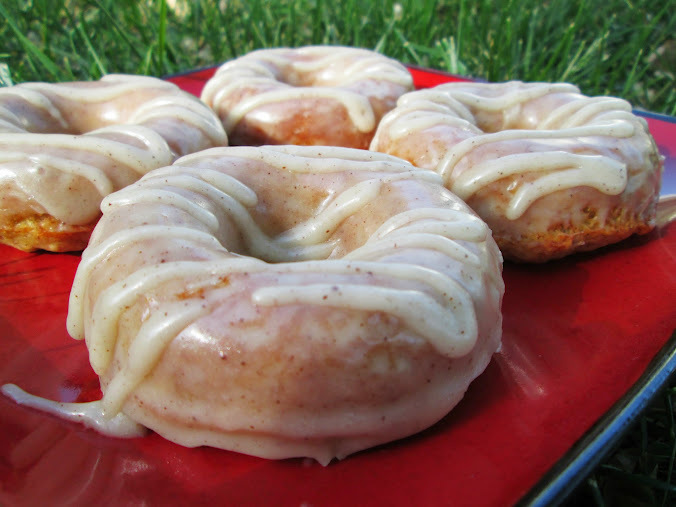 I love that brown butter glaze a lot! 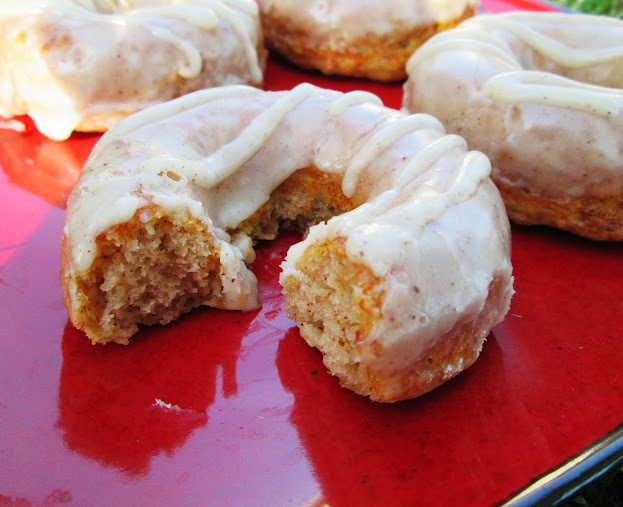 These look so delicious – I might have to think about getting a doughnut pan. I bet your doughnuts are as delicious as they look! I hear a lot about brown butter, but I have never tried it. I will have to try a recipe that includes brown butter, soon.Thanks for sharing! I need a donut pan!!!!!! I want one NOW so I can make these delicious looking doughnuts!!!!!!!! Well, obviously you HAD to have these! They look and sound so so so good! Yes, I think God was smiling on you and yes, brown butter makes everything better. :) Hope you had a wonderful, fantabulous Mother’s Day, Veronica! I don’t think there’s anything I don’t LOVE about your doughnuts. What a perfect pairing with the glaze too! They look so moist and soft.